For as much hype and excitement that has been generated around Zen and the Ryzen products so far, with everything focused on the high-end when we hit the lower elements of the stack and the volume parts, not much ‘excitement’ is to be had. We’ve already gone through the new fancy microarchitecture and the platform, and what matters at this end of the spectrum is a pure performance per dollar metric. So far the Ryzen 7 parts have certainly hit that goal, especially when originally compared to Broadwell-E when the Ryzen 7 parts per launched. For the Ryzen 3, the direct competition is Kaby Lake, and CPUs with a much higher IPC. But where Intel has two cores, AMD has four. Diving straight into the graphs, the Single Thread performance graph is as follows. 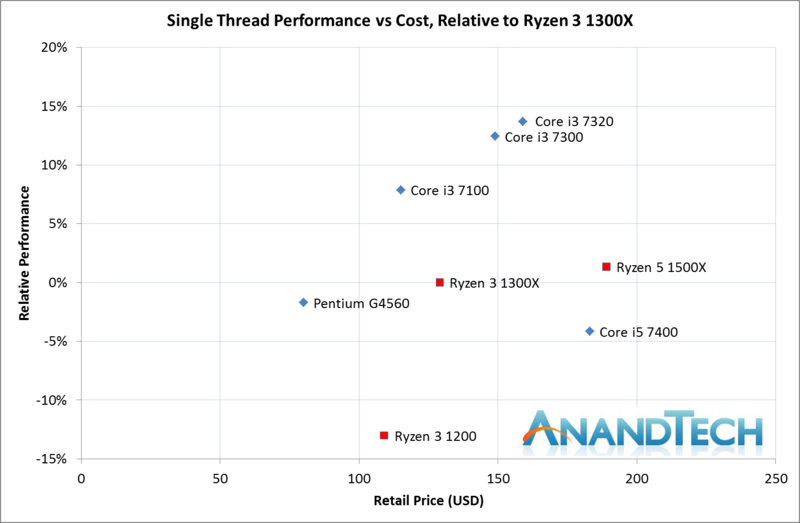 All data is shown relative to the performance of the Ryzen 3 1300X. 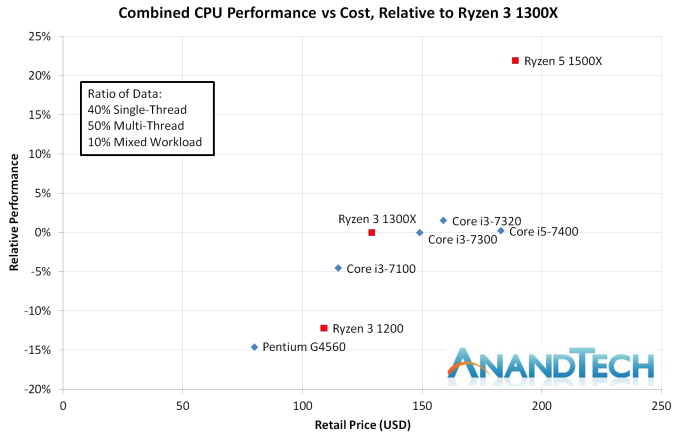 For the AMD CPUs, the 1300X and 1500X are near in base/turbo frequency (3400/3700 vs 3500/3700) and so score about the same, and the Ryzen 3 1200 at 3100/3400 scores about 13% lower. The Intel CPUs here show a distinct curve from the Pentium G4560 at 3.5 GHz through the Core i3s at 3.9 GHz, 4.0 GHz and 4.1 GHz. The Core i5 7400 scores a lot lower here, with its base frequency of 3.0 GHz and a turbo up to 3.5 GHz. 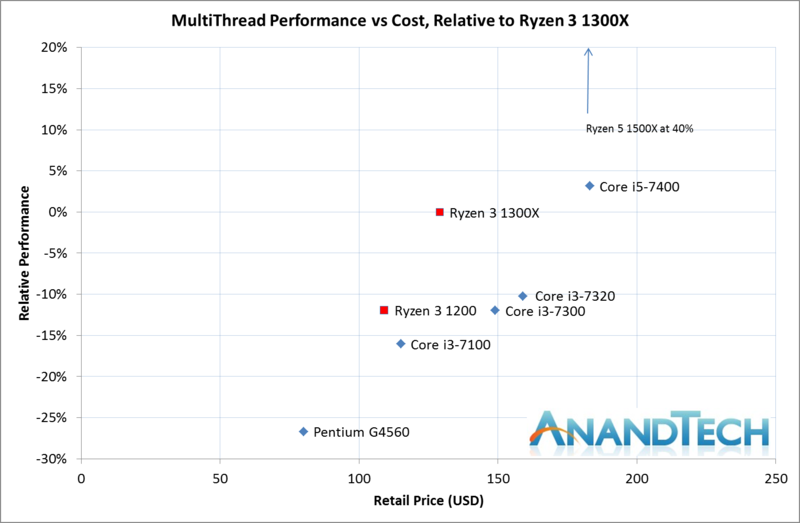 We shopped the graph here at +20% otherwise it would look odd, but the Ryzen 5 1500X with simultaneous multithreading gets a +40% boost over the 1300X, while the Ryzen 3 1200 sits again at around -12%. 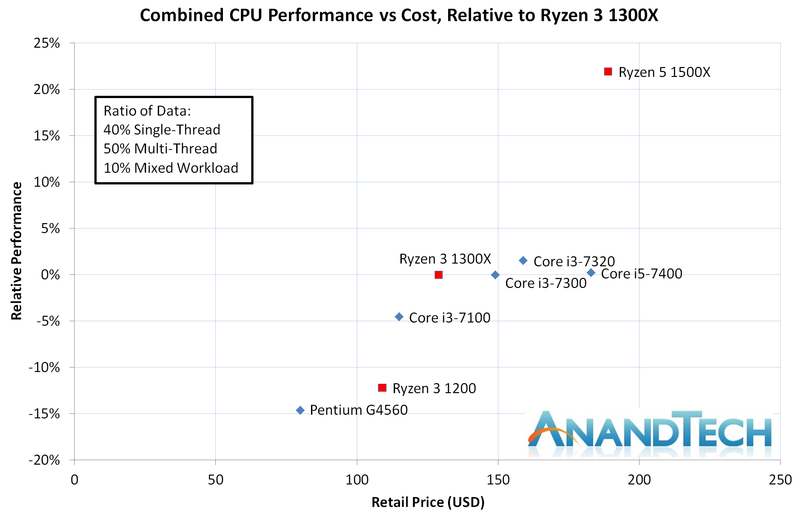 All the dual core intel parts lag behind here compared to AMD’s quad cores, although the Ryzen 3 1200 and the Core i3-7300 are closely matched – but the Ryzen wins on price by being ~$40 cheaper. The Core i5-7400, competes against the Ryzen 3 1300X here as they are both quad cores, and the Intel wins despite the lower frequency due to higher IPC – which comes at a $50+ premium. For our combined all-in-one graph, we included our mixed workload data and weighted the results 40:50:10 for single:multi:mixed thread workloads. If we ignore the Ryzen 5 1500X in the top right corner, there are a few stories here. First is that the Ryzen 3 1200 does not look like an attractive option. It performs +2-3% of the Pentium but is $30 more expensive, and the Core i3-7100 beats it by 8% for only a sub-$10 cost. Then there is the Ryzen 3 1300X. Compared to the Core i3-7300/7320 and the Core i5-7400, it clearly wins on performance per dollar all around. Compared to the Core i3-7100 though, it offers almost 5% more performance for around $10-15 more, which is just under 10% of the cost. Depending on budgets, each one could be an attractive option. We’re still working through our gaming testing as this review goes live, and we’ll add graphs for that in a bit.